Also, it isn't that L51 is absent in the West and arrives from the East - L51 just appears basically out of nowhere in roughly modern-day Germany. 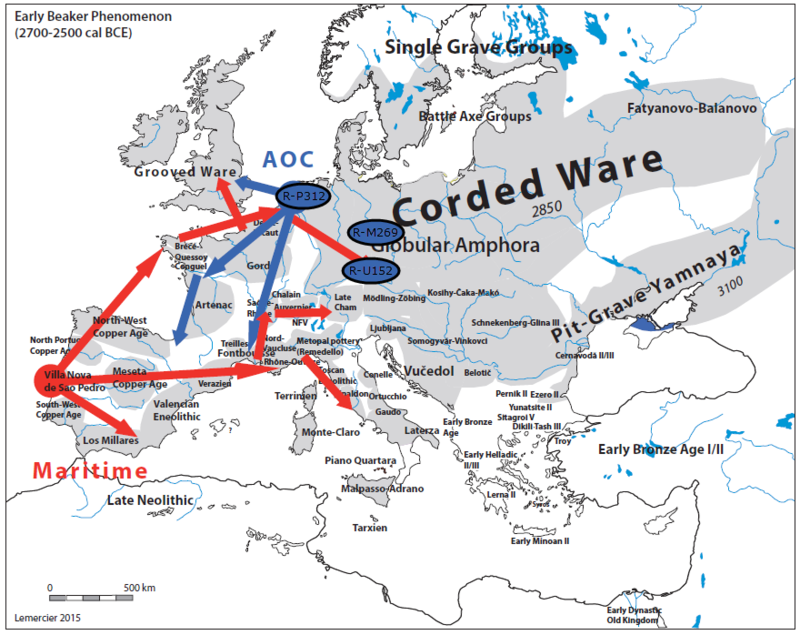 We already know that Indo-European conquerors, who came to the East, where groups of males. It looks like they killed local males and took their females. 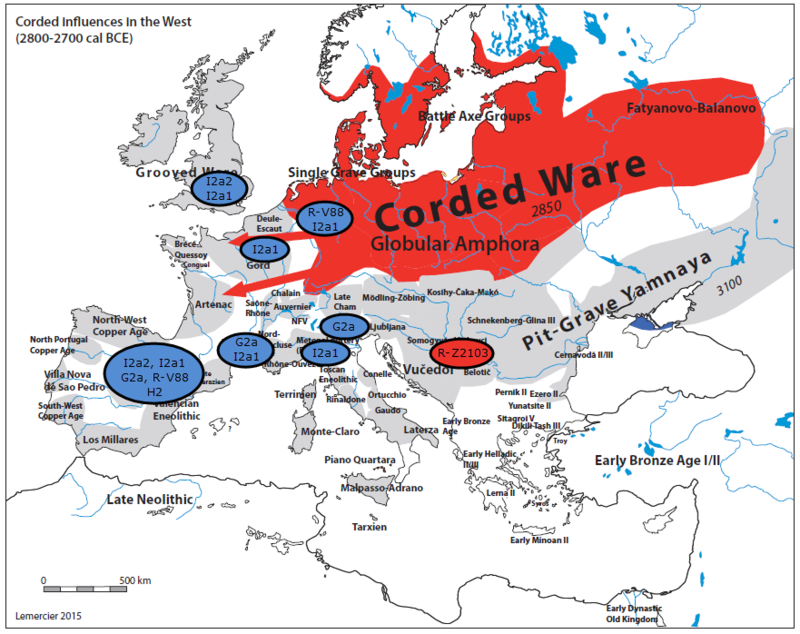 In such cases, it can easily happen that some minor Y-haplogroup became very widespread in a short time. Remember also, that there is good chance, that a group of Eastern warriors could consist of male line relatives, actually there is chance they all were the same Y-happlogroup. According to Y full, R1b-P312 has TMRCA about 4500 ybp. Eldade et al already finds it 2458–2206 calBCE on the British Isles (we should not doubt, that P312 emerged and became wide-spread on the continent). This illustrates how quickly Y-happlogroups can expand at the moment of a male-driven conquer. L51 has just 2 branches with TRMCA 4800 ybp or older, this means that as late as in 2700 calBCE there could be probably just 2 small clans with L51 people. It is OK for Y-haplogroups to appear out of nowhere in such cases. Last edited by artemv; 01-08-2019 at 05:00 AM. This human universal leads us to speculation. And to the hope that more samples will provide the answer: that this is simply a sampling problem. Or you could be right. Perhaps we will never find the evidence on this. It's just that in the past, something has usually eventually turned up. Last edited by R.Rocca; 01-14-2019 at 04:17 PM. Hi R.Rocca, just checked the ISOGG 'Y' H Tree, SK1193, and its showing a reference to the subclade 'H2c1a~', although the position is not yet confirmed, but its good to see a new downstream further subclade of Y H2. Last edited by morganman3; 01-15-2019 at 02:20 AM. Could L-51 came into CWC territory from the Prut or the Dniester or even the Pripyat river? The Prut hypothesis is not far from your Budzhak one. Is Yamnaya_Hungary really needed for L-51? Wait, R-L2 was found in ancient remains already? Wich ones? And do you think the future Swiss paper gonna show the arrivals of R-L2 in Northern Alps? Radboud, there is renewed interest in the Bell Beakers. Therefore I want to return to your British admixture. You will notice that the BB_Dutch are completely overlapping with the bulk of the the BB_Brittan. However, the Britains have a much higher frequency (29/8). The consequence is that nearly all Dutch samples have only British closest neighbors. Now if you have few non_Dutch ancestors, genetic algorithms will fall back on your Bell Beaker substrate and notice that you have more British neighbors than Dutch ones. This unbalance of the data may be caused by the size of the populations but also by undersampling of the Dutch subgroup.